It's the year of our Lord 1971, and Maureen O'Neill is one of the smartest girls at Fatima Academy. One of the funniest, too. Her teachers don't like it, but her friends think she's a riot. But one day her world begins to crumble apart, and Maureen is forced to keep a terrible secret. Meanwhile, the girls are whispering about her, the boys are starting to notice her, and the teachers are driving her crazy. 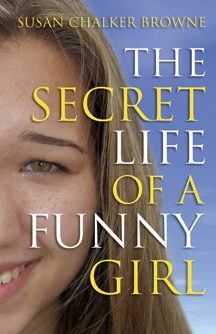 The Secret Life of a Funny Girl is award-winning writer Susan Chalker Browne's tenth book for children and her first young adult novel.